A RUP LIFE: Holiday Gift Guide: ABRAMS Appleseed Board Book Library! 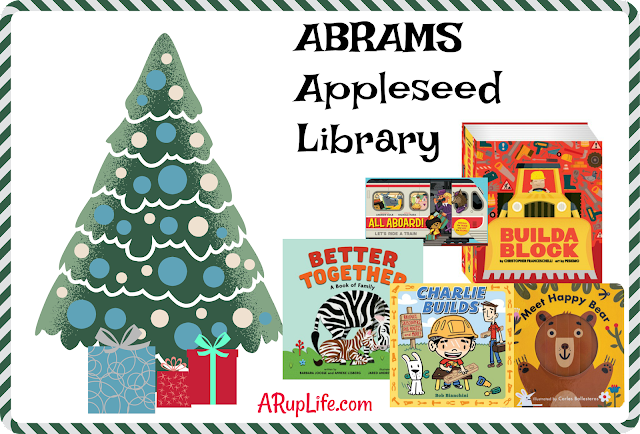 Holiday Gift Guide: ABRAMS Appleseed Board Book Library! One of my favorite gifts to give is books. I think reading and being read to is so important. 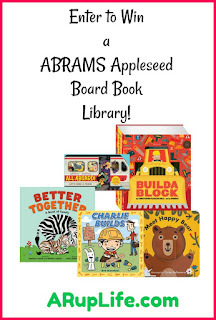 I love adding new books to our home library and we have recently added a bunch sent from ABRAMS Appleseed. 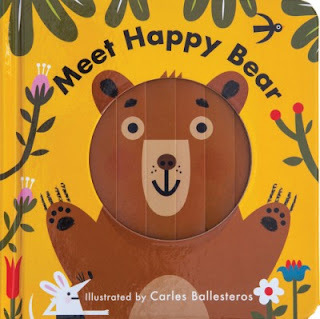 These are board books perfect for the 2 and up crowd that want a little more in their story. Many of the books are interactive which lends for some reading. 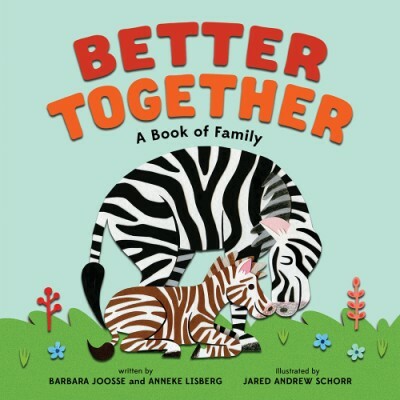 Better Together and Charlie Builds have strong family themes. 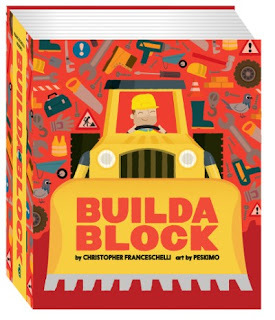 In this companion to Alphablock, Countablock, Dinoblock, and Cityblock, readers are introduced to more than 24 construction machines. As in the previous books, Buildablock features die-cut shapes on every other spread and the charming art of British design team Peskimo. This is a thick book with lots of interaction. Children can open flaps and turn pages to learn about each construction vehicles jobs. Perfect for the vehicle enthusiast. Charlie and his dad build everything together. They build sandcastles at the beach, they build blocks in Dad’s office, and they even build a doghouse for Rocky and a tree house high above the backyard. But Charlie’s favorite thing to build is a pillow fort where he and Dad can cuddle together. 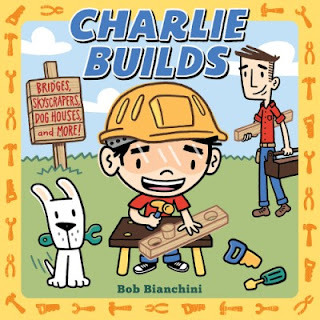 This board book combines the perennial concept of construction with a tender tale about the importance of quality time shared between father and son. 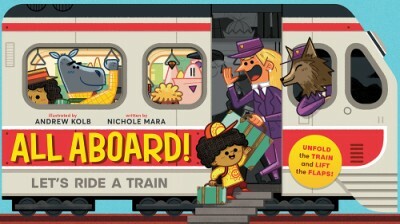 Folding out car by car, this accordion-style book takes readers on a tour of what’s inside a train. Each car has something to find—things that make loud noises, things in different shapes—and along the way, a little child searches for his missing hat. The back of the book is a running landscape dotted with objects for children to find and count. All Aboard! Let’s Ride a Train is a fun, interactive ride from beginning to end. This is a unique book in the set up. Each page is a train car that you open the flap and get to do a mini search adventure. I love how this is an interactive book perfect for busy little ones. Better Together is a beautiful story of family. We are introduced to different animals and even a child. Each time they start out alone until you open the flap and see that they are really surrounded by family. This was my favorite book of the set. While they are all wonderful my little one loved the emotions of bear and getting to cheer him up. In the end Momma Bear gives Happy Bear a hug and it is a perfect time to hug your little one. 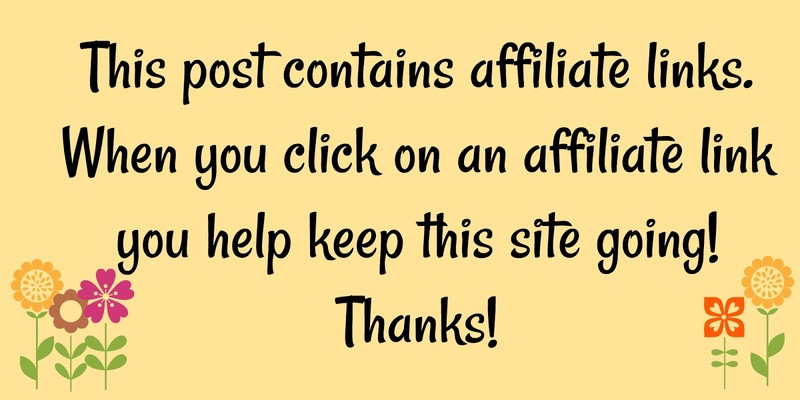 Be sure to visit Abramsbooks.com to learn more about each of these books. 3 lucky readers will win an ABRAMS Appleseed Library featuring each of the books in this post! I would read them with two year old and almost one year old boys. I will read them with the little ones in my life. I'd read them with my kids. I will read these books with my Godchild. I would read these books with my two daughters. I will read these books with my son. He's a bookworm! I will read these with my son and daughter. I will read them with my granddaughter Alivia!